There are a lot of people moving here and buying coastal property, and they begin to develop without realizing that the rules are different here than on the mainland. Realtors, very often, will only tell them what they are legally required to disclose, so the buyers are unaware that there is a whole lot more they should know. For example, because the coastline is constantly changing due to volcanic activity and rising sea level, it is a crucial first step to have a shoreline survey done. This will tell you where your official shoreline is, where you cannot develop at all, where you can develop if you apply for a special management area permit and where you can develop with just a regular building permit. Owners of coastal property have a very special responsibility to both the land AND the sea. Please don’t take that responsibility lightly. Violations will cost you much more than just a fine – it will cost you the quality of the environment in which you live and it will cost you the loss of respect of your neighbors. Development, according to land use definitions, includes even hand-clearing of coastal vegetation within 40 feet of the officially determined shoreline. Learn what plants you have before you go destroying them – some may be endangered and the federal fine is $10,000!!! This goes for inland lots as well. There is less and less native forest, our unique environment, every year. Young ‘ohi‘a may look like “scrub”, but give it time and it will someday have a girth of over 11 feet and be full of lehua flowers. It may even harbor an ‘io nest. Large albizia may look beautiful, but give it time and it will fall through your roof. You want to make the right decisions before it’s too late. As with people, appearances can be deceiving. 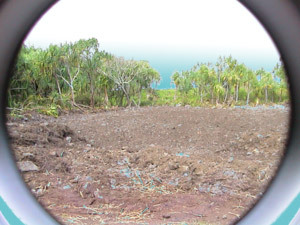 Malama O Puna offers a free service to property owners who want to learn about the plants on their lot before they make an irrevocable mistake: we will send a knowledgeable person to walk your land with you and point out what you need to know to make an informed decision. We request an honorarium to cover the person’s time and mileage – whatever you feel the service is worth to you. Every property owner who has ever taken us up on this offer has been extremely satisfied. Do yourself a favor and join their ranks. To make an appointment call René at 965-2000.